Hiya, Joe, and the vocalizing P-90/ Wild Neil, yo. Good Morning, from the Derby City. Gettin' my morning Joe! Hey, everybody! It's Monday, let's make the best of it. Thanks for tuning in! Hi Joe and listeners. Eating my breakfast with my hands makes this set even better if that possible. The Debo Band and the Ex together at Great Scott in Boston a few months ago was a mighty blessed event indeed. Sunrise over North Hollywood ... exotic, no? This Konono track is quite hypnotic. This set is smokin'! Gotta dip my head in a bucket of ice water every song break. We needed something to warm us up on this chilly miserable morning, anyway. Greetings from the heartland, Joe and fellow noisemakers! Hope everyone had a swell May Day. Or Beltane, if you swing that way. Pylon! The great lost band of the indie underground. I love these guys. Another lost band. The April showers are a couple of days late this year. What kooky weather! It's drowning the May flowers. Coffee & Joe. A perfect way to counter this cold grey rainy day. Oliver Sain was a big talent who had a lot of influence on soul music. Thanks, Ike! Nice to see you at the fair! Fat Whit Family was great indeed. Chance made my day though. I have a great video of him kissing that lady in the front. Its from behind so you can't exactly see what happened but he flies up in her face haha. a cupa joe and joe @Marc Francs...I agree! OK, I will like Fat White Family's name better if they are 1) fat or 2) a family, or 3) none of the above in EVERY category. with dancing in the kitchen to follow I suspect! Thank you @Joe McG! @highlowe: Dancing in the kitchen is always a good idea! Also, I would accept it if they were all three catergories. @highlowe: The wiggling has definitely begun in my kitchen! I also rode the merry go round this year, which is something I've wanted to do for years. Joe doesn't fake the funk! Bringin it to the people! Mmmmph ! Ha! Get Down with your bad selves! I don't know if you can do this Joe, but I'd love to hear Brick's "Ain't Gonna Hurt Nobody". @Cecile: I don't have any with me, but I'll take a look in the library. I miss the Record Fair. Can we all go back and live there? thank you, Joe, that's so nice of you. Bummed I missed the Record Fair, out of town (bank account escaped a hit, though). @Greg: It's like this magic city that rises up and then magically disappears in 3 days. @Cecile: Sorry! There might be some Brick in the basement library, but nothing upstairs...I should have brought my "Dusic" 45. Does anyone else hear a similarity between this guitar solo and "Another Brick in the Wall?" I have played the Journey into Paradise comp so much. that's fine, Joe, thank you for looking! I thought I'd never see it, but there are blues skies over the isthmus again. Joe gets partial credit for chasing off the clouds. Surface Noise chases clouds, blues, heartache, gout and a thousand other ills away. @Brian: How nice! @Brendan: I'm hiring you as my PR guy. "I never thought this could happen to me"
Another reason why 1977 statistically had one of the highest rates of one-hit wonders of any year. You should play "telephone man" to make my pain complete. Love this "Do You Know What I Mean"...the original minimalist band. Ha! The bass just jumps off this single! I know Reginald Dwight was listening to this at the time. ok...smooth transition from soul to country. hat's off! I just went to a women's leadership conference, and left feeling misogynistic. It was depressing for so many reasons. But the food was good. hahahahha, that last line saved the whole song!!! Leadership sullies your soul. Don't let them get away with it! Michael Brown from the Left Banke? Wow, this sounds like a player piano. that was a treat! I have to find that. looks like I'll be going down the "Orange Juice" rabbit hole! I wish Sam Cooke was alive, judging American Idol, and then showing them what they were doing wrong. Have you heard the 'Orange Juice and Velvet Underwear ' by Intersystems? Its quite... different. We need a jello mould filled with fruit, now. @herb: How odd, I had the Charles Bradley CD with me and just didn't get to it. Some of the best punk music came out of being trapped in the suburbs. Let's not knock it. this guy wrote "Burning Love" and "Goodbye Earl"
Yep, the music got out. The musicians never made it. Hi Joe. Been listening off and on all morning but just getting a chance to check in. You sound tired, but a good kind of tired. You sound like you believe -- and quite rightly so -- that you are on the far end of a job well done. Funny that I should tune in and hear Method Actors. You played Pylon earlier. I saw the two of them on a double bill at Trax on West 72nd Street in '80. Ah, thanks, Parq! I think we did pretty OK! I've never heard The Method Actors, but boy do they take me back to the early 80s. What fun. Did you know 'sardonic' has its roots in Sardinia? freddie kaboodleschnitzer still corners the market in the 'drummer name' dept. By the time I saw Lee Michaels he only played electric piano, having given up organ to preserve his hearing. Frosty was there. "Frosty" a bit more of an exotic dancer name than a drummer name, but OK.
And I might be mistaken, but by 1977 Virgin was indeed regarded as a pretty big label. "The Latin adjective is < Greek Σαρδόνιος Sardinian, which in late Greek was substituted for σαρδάνιος (Homer, etc. ; of obscure origin), as the descriptive epithet of bitter or scornful laughter; the motive of the substitution was the notion that the word had primary reference to the effects of eating a ‘Sardinian plant’ (Latin herba Sardonia or Sardōa), which was said to produce facial convulsions resembling horrible laughter, usually followed by death." I bought some Alan Watts tapes at that flea market! I think it was the first time I ever visited the station. Figs in a flakey pie crust sounds good. I want to see the Crust! @Cheri Pi: Of course I will, e-mail me later on. (wow, i see Matt Warwick's name & i wanna pee. no, not a fetish thing - it's that whenever i tune into his show it's bec i wake and need to go to bathroom) my friend is a big Upper Crust fan and i saw them at an 826NYC (?) benefit at irving plaza, years ago. they royally rocked. @Dean: see also the classic 1961 psychological horror film "Mr. Sardonicus." I like chicken pot pies with the delicious, flaky crust on top. I dislike chicken pot pies that don't have a bottom crust. What a scam! No bottom crust? I've never heard of such a thing. That just ain't right. I looked up that we the people tune- the credits don't list any sitar-type instruments. Was Ellen playing that on a guitar with a slide? It was tremendous! love the Crust too - just saw them in March. Weird thing is they never have any merch with them! Bottomless pie, served with a helping of sardonic laughter. @statoj: Yes, she was a slide player. She played the hell out of it, too! @Ken-The upper crust had a meeting, they kicked out the bottom crust, they were too uppity. I'll email you the memo. I verbally protested, but wanted to keep my job so I just shut up. Sorry, dude. Did not know At Swin 2 Birds had been reissued. @Herb: Yes, Jason Sigal is a member of Lame Drivers, the openers. This is disturbing news. I don't think I've ever seen a pie, store-bought, home made, or served in a restaurant, that "cheated" by not having crust on the bottom. Egads, what will they think of next? Has Bernie and/or Hillary taken a position on this? Once when I was in elementary school my mother put an individually wrapped piece of cherry pie (no Freud jokes, please) in my lunch, which was weird, because I don't recall her ever giving me dessert-type stuff at lunch. I only realized after eating about half the slice that it was resting on a thin piece of cardboard. I'd taken several bites from the cardboard. Its also an easier desert. Some berries sprinkled with a crumbled mixture of rolled oats, flour, small chunks of butter sprinkled with sugar makes a nice cobbler. Or crumble some chocolate chip cookies over raspberries in ramekins . In and out the oven in 15 mins and throw a scoop of ice cream and .. Uh i gotta go! Dean, you were probably busy thinking about word derivations. Thanks, by the way for that gem about Sardenia. Made my day. beautiful show Joe! Thank you! Extra crust wouldn't save a steak and kidney pie. Blech. Glad you're enjoying it, highlowe! Soothing to be along w/ Clan McGasko of a Monday morning. Still looking forward to the all-cover show featuring "You Know my Name, Look up the Number" , Joe. Lennon! Perfect! Thank you, Joe! I wonder if the double-decker pie has been invented yet. Even more crust to work with! Thanks, Jeff, good to see you! Happy to oblige, @statoj. I agree. Facial Convulsions Resembling Horrible Laughter, Usually Followed by Death would make a great band name. @Ken-yes, you spell pie crust-p-I-e-crust. Thanks for the music, Joe! You bet, Melinda, so happy to do it! Dean, I think an acronym would be helpful for that band name although darn difficult. @KenFromHydePark: Tony Manero eats two slices of pizza pie on top of each other at the beginning of "Saturday Night Fever." Think you'd have to bake the double pies separately and construct after. No way to bake a center crust . I like the way you're thinking though. Keep exploring the kitchen space and play with it. Good pie talk. I'm soon to be gone, so I just want to say thanks again to anyone who made it to the Record Fair and spent their hard-earned moolah, especially at WFMU's tables, and thanks to everyone for listening and commenting! Thank you, Joe, for making another Monday bearable. Such a nice show Joe, thanks. Joe man, you killed it today! The elusive 'McGasko sound' can never be copied. Thank you. Cool show Joe! Double crust pies sound good but impractical to make...unless you make like a bundt type hole to expose the center crust? I don't know...its a crusty problem! Yes, great show, great record fair, Thanks Joe and WFMU! Donald Trump eats his pizza pie with knife and fork. Neil, i lost my appetite when i read 'crusty' and 'hole' in the same descripion. Just discovered another stellar fmu dj. About to start new paintings and that last set threw me into the paint in a big way! Thanks Joe! Thanks, hendrix wolfbat, glad you found me! 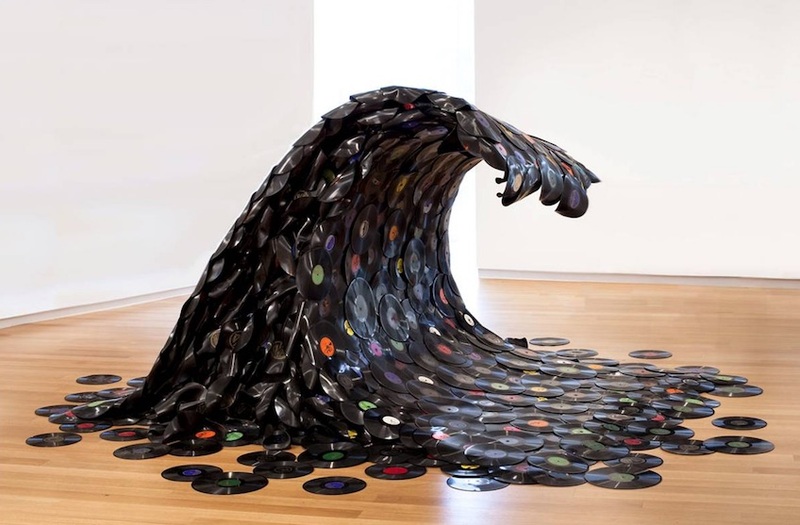 Today's playlist pic is art by Jean Shin called "Sound Wave."